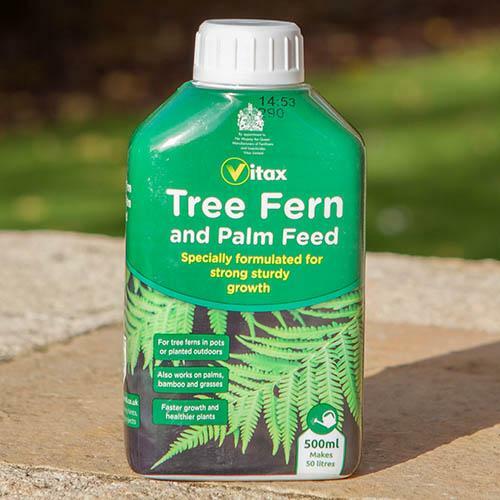 New for 2019 Vitax Tree Fern and Palm feed is a complete plant food for use both indoor and out. Containing all the major plant nutrients plus magnesium and trace elements, making it the perfect feed for tree ferns in pots and planted outdoors. It's also an ideal feed for indoor and outdoor palms, bamboo, grasses and other ferns. Tree ferns thrive in a sheltered, humid and shaded position, in humus-rich soil, gaining nutrients from decaying vegetation that falls from the forest canopy into the crown of the tree fern. Vitax Tree Fern and Palm feed replicates this process to maximising growth, maintain colour and ensure a strong, healthy plant. The trunk and crown of tree ferns will not tolerate drying out, so water regularly to ensure that it remains moist, and spray the trunk with water during hot or dry weather; this will encourage the tree to send out roots. After roots have established, you can commence feeding, applying the liquid feed to both crown and trunk every 7-10 days during the growing season (from April to July). Measure 1 capful (20ml) and add to 2L of water. On an already wetted trunk, slowly pour the mixture into the crown and allow it to overflow and soak into the trunk. A thick layer of organic mulch on the ground surrounding the trunk will help feed the plant slowly and naturally. Feed palms, bamboos grasses and other ferns using 1 capful in 2L of water every 7-10 days while in growth.